This chapter analyses the period of 1764-1811 and the first European settlements on the Falkland/Malvinas Islands in the 18th century; it also deals with the subsequent disputes among France, Spain and Great Britain. It will show that the first occupant of the Falklands/Malvinas was France, which immediately recognised Spain´s pre-existing sovereignty and handed over the islands to the legitimate sovereign. It will also show that Britain´s occupation of a port on one of the islands of the archipelago was in breach of existing treaties; and that this occupation was belated, precarious, secretive and subsequently abandoned. Besides the treaties analysed in the previous chapter, the 1770 incident, the Hispano-British declaration of 1771, British withdrawal from the site authorised by Spain, and the fact that Spain exercised exclusive possession and sovereignty over the islands for decades, until the beginning of the Argentine process of independence in 1810, prove that Argentina incontestably succeeded to Spain´s rights. It is worth noting that the directions given to Byron refer to the “Falkland and Peppys” islands. The latter were often believed to be situated in an area near the Falklands/Malvinas, but they do not exist. The British government believed they had been “discovered” by His Majesty´s seamen. It gave secret instructions to its sailors in full awareness of the opposition Spain had manifested years before, leading Byron to believe that the islands he was to survey already belonged to the British crown. Differently to Bougainville´s actions, which consisted in establishing a colony, Byron took possession, left the British flag raised and set sail a few days later (on January 27th) without leaving behind any settlement. A month later, he sent the ship “Florida” to Great Britain to bring news. When the “Florida” landed on June 21st, 1765, British authorities decided to build a settlement at Port Egmont. News had already been received of France´s establishment. On the Spanish side, news of the French settlement set alarm bells ringing. 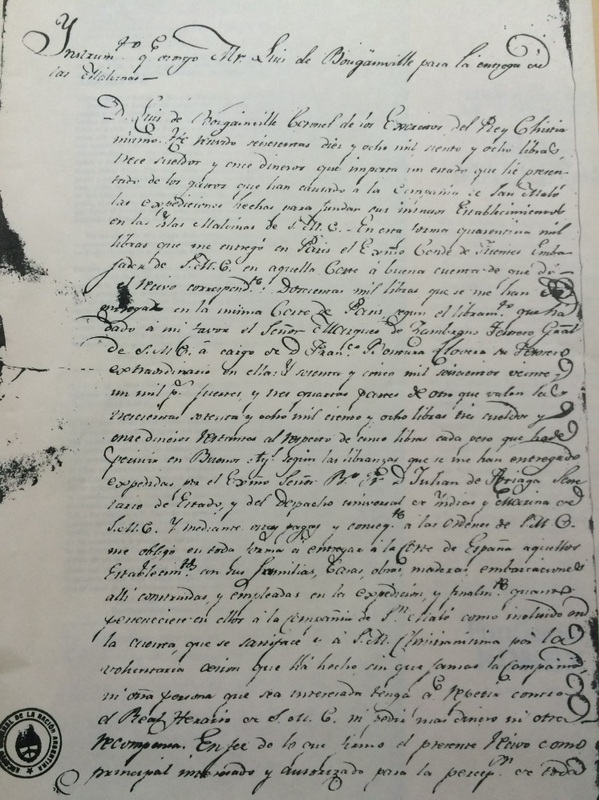 In September 1765, the Spanish minister of State, the Marquis of Grimaldi, gave instructions to Ambassador Fuentes to submit to Choiseul an official request for France´s withdrawal, on the basis of Spanish sovereignty, as well as legal and political considerations.6 After Choiseul´s first refusal, Fernando de Magallón, secretary at the Spanish embassy in France, reminded him that Spain had already asserted its rights against England in 1749 when it came to know about Anson´s expedition. Only twenty-four hours later, Choiseul met Fuentes and acceded to Spain´s request. When Bougainville returned, he was notified of the situation and asked to go to Madrid to iron out the details of the transfer. On the British side, on September 26th, 1765, Commander J. McBride received orders to build a fort “in Port Egmont in the Falkland Island.”7 On January 8th, 1766, he entered the port. McBride´s men sighted the French settlement on December 2nd, 1766, and were already in Port Louis on December 4th, setting sail for England in January 1767. Although the sailors declared that the islands belonged to His Majesty, the British government did not lodge any official protest over France´s presence in the Falkland/Malvinas Islands. Contrary to the French occupation, and later to Argentina´s taking of possession in 1820, no public announcement was given of Britain´s settlement at Port Egmont. This point, and the absence of British protest, show that the British government maintained a clandestine occupation of a place in the Falklands/Malvinas, in the knowledge that its settlement was in violation of the treaties concluded with Spain, and that France had been the first to occupy the islands. Bougainville´s formal recognition that the settlement had been established in Spanish territory, and that its cession had been voluntary, was both express and manifest. Furthermore, Choiseul´s comments to the British Ambassador in Paris12 demonstrate that not only did France recognise Spain´s pre-existing sovereignty, but that it also informed the British government of it. Again, the British government did not raise any claim of sovereignty in the circumstances, which proves it either did not consider itself sovereign, or if it did, it was abandoning its claim against third States. On that same occasion, Spanish Navy Captain Mr Felipe Ruiz Puente received the order to take over the colony as Governor, and was notified that the islands´ authorities would be under the command of the Governor and General Captain of Buenos Aires Province,13 Mr Francisco de Paula Bucarelli, whose orders he had to obey. That is to say, from the administrative point of view, the government of the Falklands/Malvinas was part of the Captaincy General of Buenos Aires. On April 1st, 1767, the Spanish governor and Louis-Antoine de Bougainville landed at the Falklands/Malvinas Islands. The official transfer of the colony to the Spanish Crown was performed, and the name Port Louis changed to Puerto de la Soledad. By the year 1767, three powers had established themselves in the Falkland/Malvinas Islands, with varying degrees of lawfulness. France can claim the right of first occupant, despite recognising, when faced with Spanish protests, that the islands belonged to Spain. This was consistent with recognition by the powers of the time that the region was considered to be Spanish. Byron´s declaration lacks any legal effect. It was a merely symbolic act performed at a moment in which another nation was already effectively occupying the archipelago, and furthermore in a region that Great Britain had recognised as being Spanish. The settlement established by McBride years later suffers the same defects: occupation does not establish sovereignty over a territory that is not terra nullius (land belonging to nobody), either because the occupying State recognises that the territory belongs to another nation (Spain), or because the territory was previously occupied (by France). In international law, occupation of the main island constitutes occupation of the archipelago as a whole, as long as no other nation is present in any other area of the archipelago, as Judge Levi Carneiro explained in the Minquiers and Ecrehos case before the International Court of Justice.15 This was the situation of the Falkland/Malvinas Islands when they were occupied by France. The system of treaties binding Spain and Great Britain analysed in the prior section made it impossible for the latter to sail or trade in the American seas and territories belonging to the Spanish Crown. The Falkland/Malvinas Islands were among those possessions, as demonstrated by Spain´s reaction to the expedition proposed by Lord Anson in 1749. The settlement of Port Egmont was a flagrant violation of those agreements and, therefore, a violation of the basic principle of the international law known as pacta sunt servanda, by virtue of which treaties must be respected. The British settlement was clearly established in bad faith. Great Britain knew about France´s settlement, Spain´s protests and the subsequent cession, which was relayed by Choiseul on September 17th, 1766. The British government did not raise any objection. 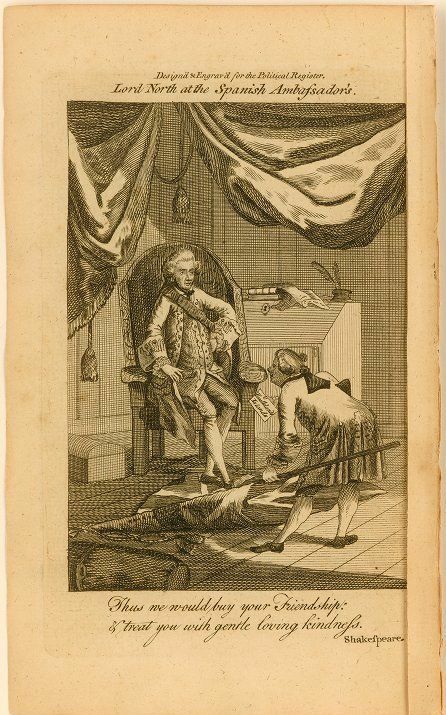 In 1766 the Prince of Masseran, Spain´s ambassador to London, upon learning that the British fleet had been sent to the South Atlantic, immediately informed Madrid. When Charles III realised that the British were in a region of Spanish dominion, he directed Masseran to submit a request for information about the facts in question. Fearing that England might settle indefinitely in its dominions, Spain hardened its position. The Secretary of the Indies, Mr. Julián de Arriaga, ordered Bucarelli: “no English settlement whatsoever is allowed, and to expel by force any already formed if warnings according to law are not enough: and without the need for further orders or instructions.”21 On the basis of this order, on October 15th, 1768 a fleet under the command of the Navy Chief of Staff, Juan Ignacio de Madariaga, set sail from Cadiz. Only in the second half of November 1769 was the British settlement finally discovered by a Spanish schooner. Governor Ruiz Puente immediately sent Infantry Lieutenant Mario Plata to order the eviction of the intruders, since their stay in the area “is entirely opposed to the faithful and religious observance of the Treaties of Peace.”22 The British captain Anthony Hunt answered on December 10th, stating that the islands belonged to His Britannic Majesty and that he ordered the Spanish to leave Port Soledad within six months. In May 1770, having sent a fleet in February to survey the British settlement and having protested against the British “intruding in an alien domain”,23 the governor of Buenos Aires dispatched Chief of Staff Madariaga with four frigates and two small ships with the aim of evicting the intruders. Between June 7th and 9th, both parties fruitlessly exchanged requests and threats. On June 10th, Madariaga considered that the situation had become unsustainable, and ordered the takeover of the settlement. At the first volley of cannon fire, the British surrendered and 156 men laid down their weapons. Port Egmont was free from invaders. In September 1770, the British Crown discovered what had happened in the Falklands/Malvinas and protested to Spain. The Spanish and French prepared to begin new negotiations to avoid, or at least put off, the outbreak of an armed conflict. It is not within the scope of this work to go further into the long and difficult diplomatic negotiations. The stances of both parties can be easily summarised as follows: the British sought unconditional compensation and the resettlement of Port Egmont, while Spain offered to express disapproval of Bucarelli´s actions and the reestablishment of the settlement at Port Egmont, in exchange for His Britannic Majesty´s disapproval of the requests and threats made by Captain Hunt, as well as an express backing of Spanish sovereignty over the archipelago. Several proposals were discussed and discarded until an impasse was reached. While the negotiations were being conducted, both powers had speeded up the readying of their armed forces. It should be noted, en passant, that Great Britain took a completely opposing attitude towards Argentina in 1833, when they used force to deprive Argentina of its possession on the basis of unfounded arguments of sovereignty. Pascoe and Pepper highlight a proposal made during the negotiations to explicitly recognise Spanish sovereignty, which was not accepted by the British government. The proposal would have been considered an unacceptable humiliation by British public opinion, which had closely followed news of the eviction from the fort in Port Egmont. However, the fact that no explicit recognition of Spanish sovereignty was given in the declaration did not mean that Spain had abandoned its position and implicitly accepted that of the other party. In the final text, only one party formulated a reservation of sovereignty: Spain. The other failed to do so. One of the parties returned exclusive possession of a fort, affirming that this restitution in no way affected the question of sovereignty. What sovereignty could this possibly be but Spain´s? It would be absurd for a State that claims sovereignty to reserve the alleged sovereignty of the other, as the British pamphlet naively claims. Dr. Johnson´s analysis does not in any way support the forced and unjustified interpretation made by the British pamphlet. In summary: Spain only returned possession of Port Egmont and reserved its rights of sovereignty over the Falklands/Malvinas and the archipelago as a whole. The British government was happy to accept this as satisfaction for the stain on its honour caused by the forceful eviction, without seeking to make any claim with respect to their alleged sovereignty. From the moment the 1771 agreement was concluded, much has been said and written about the existence of a secret promise by which, once British honour had been restored by the restitution of Port Egmont, the port would eventually be abandoned. For reasons of internal politics and public opinion, the promise could not be made in writing. Pascoe and Pepper venture to claim that such a promise never existed. The only argument they put forward is that in 1829, when for the first time in almost half a century the British government showed some interest in the Falkland/Malvinas Islands, Sir Herbert Jenner, the King´s Lawyer, affirmed that he could not find any documents supporting that promise.33 This is evidently a weak argument, especially because it is well known that Jenner was looking for arguments in support of Britain´s purported sovereignty over the islands. Even though no written document containing the promise has been found, there is ample evidence as to the existence of a verbal promise and its content. The exchange of letters between the Spanish and the French ambassadors in London, British diplomatic notes, and debates in Parliament and in British newspapers are strong indications that such a promise did in fact exist. This ample documentation is simply ignored by the British pamphlet. The evidence concerning the secret promise made by Great Britain to abandon Port Egmont – and with it any fanciful claim of sovereignty – is conclusive. It comes from those having directly participated in the negotiations, and the officials involved. Further facts support this evidence: England left Port Egmont in 1774, and despite leaving behind a plaque and a flag, no official act of possession, no act of authority, nor any protest was made again, despite Spain´s presence in the archipelago and particularly the destruction of the fort and the removal of the British symbols by the Spanish authorities in the Falklands/Malvinas. Although not formally concluded, the promise was binding: pacta sunt servanda. In any case, even if the promise had not existed, Great Britain left Port Egmont and, as we shall see, did not reserve its rights of sovereignty as against Spain. On September 16th, 1771, the Spanish official Francisco de Orduña, sent by the Spanish Governor of the Falkland/Malvinas Islands, Felipe Ruiz Puente, officially handed over Port Egmont to the British Captain John Stott.48 The British authors appear to neglect an unavoidable conclusion: if the islands were British, then Great Britain should have been the one to authorise Spanish presence on the islands. Instead, quite the opposite happened. In the entire course of events, not a single British note exists protesting against Spain´s presence on the islands. It is interesting to highlight the British note sent to Spain. If Great Britain considered itself sovereign over the islands, there would be no reason to notify Spain. Yet the note existed. And, if a note existed, its aim must have been the preservation of sovereignty - especially when the power abandoning the territory knows that the other will remain on the territory. There was no such note reserving sovereignty. Nor was there any request for Spain to withdraw, and less still any “authorisation” for Spain to remain on the territory. The reasons invoked are less than credible. What economic influence could be wielded by 50 men , who were relieved once a year and could in any case be put to use elsewhere, within the British Empire´s military budget? If the purpose of the withdrawal was to reduce the naval forces in the Indies, why only repatriate the garrison at Port Egmont? In short, in 1771, Great Britain, one of the greatest military powers of the time, was determined to go to war over Port Egmont, but the following year it considerably reduced the troops deployed in that port and only 2 years later ordered the abandonment of a 50- man garrison “for economic reasons”. It is not difficult to see that the reason for the abandonment of Port Egmont was something more important that a mere budgetary readjustment. The unavoidable truth is that the only wish the British government had in 1771-1774 was to save face. And as we shall see, if they were not in a condition to maintain their position at Port Egmont, the simple fact of leaving behind British insignia was not sufficient to retain any title over the territory. Whatever the reason for the abandonment, it was carried out in mid-May 1774, leaving behind a leaden plaque stating that the islands belonged to the King of Great Britain. As we already saw in the case of discovery, a merely symbolic act (such as installing a cross or a plaque) was not enough to establish a right of sovereignty – much less could a symbolic act of this nature be sufficient to retain sovereignty over time. But that is not all. This note is particularly important for a variety of reasons: 1) because it clearly shows that the Spanish government understood Britain´s withdrawal as a relinquishment 2) because it explicitly stated the intention to exercise sovereignty over the port which had up to that moment been in Great Britain´s hands, 3) because it clearly states the intention of preventing the British from returning, which implies the will to exercise sovereignty and exclusive possession over the archipelago as a whole and 4) because both British conduct and the Spanish note support the thesis of the British promise to abandon Port Egmont once it had been returned. On June 30th, 1777, José Gálvez, Minister of the Indies, sent a Royal Order to the Viceroy of the Río de la Plata for him to “proceed to burn the buildings of all types that may be completed or started, doing the same with the materials that are gathered”54 This order was fulfilled at the beginning of 1780 by an expedition under the command of Callexas, thus erasing any sign of Britain´s presence in the Falkland/Malvinas Islands (see Figure 6). Figure 6 Drawing of Port Egmont destroyed by the Spaniards; the legend reads:"Drawing of the establishment of the Englishmen in Port Egmont of the Island of the Great Malvina, burned and demolished its buildings on March 22, 1780 by order of Excmo. Sr. Dn Juan Jose de Vertiz, General of the Royal Armies Viceroy Governor and Capitan General of the Provinces of the Rio de la Plata, by the First Pilot of the Number of the Royal Navy and Capitan of the King the Rosario Dn Juan Pasqual Callexa"
Spain maintained control over the whole archipelago, the order was issued in a time of peace with Great Britain (that is to say, it was not a mere act of war nor an act carried out by reason of a war) and last but not least, the order was issued to (and executed by) the official in control of the Governorate of the Malvinas (under whose authority the islands lay), that is, the Viceroy of the Río de la Plata. Great Britain abandoned Port Egmont in 1774 and since then, for 55 years, there was no official British presence on the islands, nor any official acts relating to them, and less still any effective acts of sovereignty over the islands or in relation to them. On the contrary, there was no official reaction to the destruction of the settlement at Port Egmont carried out by Spain and nothing was said about the continuous and exclusive presence of Spain in the islands, with 32 governors that reported to Buenos Aires. Britain said nothing at the time it signed the convention of Nootka Sound, which by virtue of its Article VI prevented Britain from settling the Falkland/Malvinas Islands. Not a word was said when in 1806-1807 British officials invaded Buenos Aires and found the leaden plaque left behind in the once-British settlement. Another relevant question is why Great Britain, when attempting to conquer the Viceroyalty of the Río de la Plata, did not take any action against Spain´s presence in the only territory that supposedly was British. If the question had not been settled in 1771, here was an excellent opportunity to settle it in their favour. On Spain´s part, the removal of the plaque left at Port Egmont was a clear sign of its will to repudiate any pretention of British sovereignty. Even leaving aside the lack of British reaction to the Spanish authorities´ control over Port Egmont, including its subsequent destruction, it is worth pointing out that the British found the plaque the Spanish had removed in Buenos Aires, between 1806 and 1807. There was no official reaction by Great Britain in regard to acts of enforcement performed by Spain against the sailors of the British Crown visiting the islands, as we will see later. Nor was there any reaction by Britain to the various acts of sovereignty carried out by the new-born Argentine government between 1810 and 1829. During the period under discussion, Spain had a continuous presence in the Falkland/Malvinas Islands from April 1st, 1767, when Louis-Antoine de Bougainville transferred the French settlement founded in 1764 to the Spanish authorities, until February 13th, 1811, when Spanish troops were withdrawn from Port Soledad. Spain was present “à titre de souverain”, as is proven by the appointment of Mr. Felipe Ruiz Puente as Governor of the Malvinas, and the proclamation of the islands as a dependency of the General Captaincy of Buenos Aires made by King Charles II on October 4th, 1766. Official Spanish presence was permanent, and its authorities succeed one another on a continuous basis for the entire period (32 Governors and Commandants were appointed by the Viceroy of Buenos Aires); by order of the King of Spain, they were to be relieved annually, between mid December and mid January.56 The Commandants relied upon a minister of the Royal Treasury and periodically formed governing boards (juntas de gobierno) which also included the Commander of the main ship anchored at Port Soledad.57 The islands were inhabited by a military detachment, prisoners, settlers and Catholic priests. The Church of Nuestra Señora de la Soledad operated on Soledad Island, and construction of the stone church was completed on November 4th, 1801. British sources refer to the Spanish settlement as a prison; this probably arises from the translation of the word “presidio” and its current meaning of “prison”. However, in Spanish America, “presidios” were not prisons. The term was used to refer to settlements situated at the outermost points of Spain´s dominions that worked as protection against the frequent attacks of privateers and pirates, as well as being a means of protecting Spanish sovereignty by preventing other nations from settling in the area. Regardless, even if the only Spanish presence had been a prison, it would still have been sufficient to constitute an effective act of government authority. The Governors of the islands were mostly preoccupied with maintaining Spanish presence in the southernmost territories of the Empire, and to control the activities of other nations in the region. This was an official and public presence that no other maritime power ignored or could ignore, which was in charge of policing and law enforcement in and around the islands of the entire archipelago. Frequent journeys were made around the archipelago and along the Patagonian coasts. Spanish authorities on the islands also kept a detailed record of the cattle present on the islands, which was considered to belong to the Royal Treasury, and carried out maintenance of military facilities, as proven by the periodical reports on both matters sent by the Commandants to Buenos Aires. The preliminary Memorandum dated September 17, 1946 drafted by the Research Department of the Foreign Office, is also revealing.64 The subtitle leaves no room for doubt: “Spanish Sovereignty 1774-1811”. It recognises that after Britain´s withdrawal from Port Egmont, the Spanish Governor of the Malvinas was instructed to ensure that the English did not return and that their facilities were destroyed, and that nine governors succeeded one another in Port Soledad, placing the date of Spanish withdrawal between 1811 and 1813. Taken together, these documents show that the British had no doubt about Spain´s sovereignty over the archipelago. This is not an isolated assertion, but a series of concurring opinions given over more than thirty years, among which that of Foreign Secretary Anthony Eden, and three memoranda that are working documents of the Foreign Office, as well as an internal research document on the matter. Obviously, it is completely irrelevant whether the persons sent to the islands would have preferred to be there or in a less inhospitable location. As to the fact that English and American ships continued to use the islands “ignoring” Spain´s presence, we have already seen that the Spanish tried to enforce respect for their laws. In any case, not being government ships, their actions were irrelevant as far as the question of sovereignty is concerned. Many other documents refer to the archipelago in general terms and therefore use the plural. We have already seen some of them, as well as Spain´s concrete actions in the whole of the archipelago, including in Port Egmont. Francisco Xavier de Viana introduces himself as the “Governor of these Malvinas Islands” in the government agreement concluded in Soledad de Malvinas, on April 18th, 1800.67 Antonio Leal de Ibarra signs the letter notifying the capture of the English brig “San Agustín” as “Commandant of the Malvinas”68 The aforementioned facts, as well as the destruction of the British fort at Port Egmont and regular visits to ensure the British had not returned, as well as the exercise of authority over foreign ships located on other islands of the archipelago, clearly show that Spanish sovereignty extended to the archipelago as a whole. 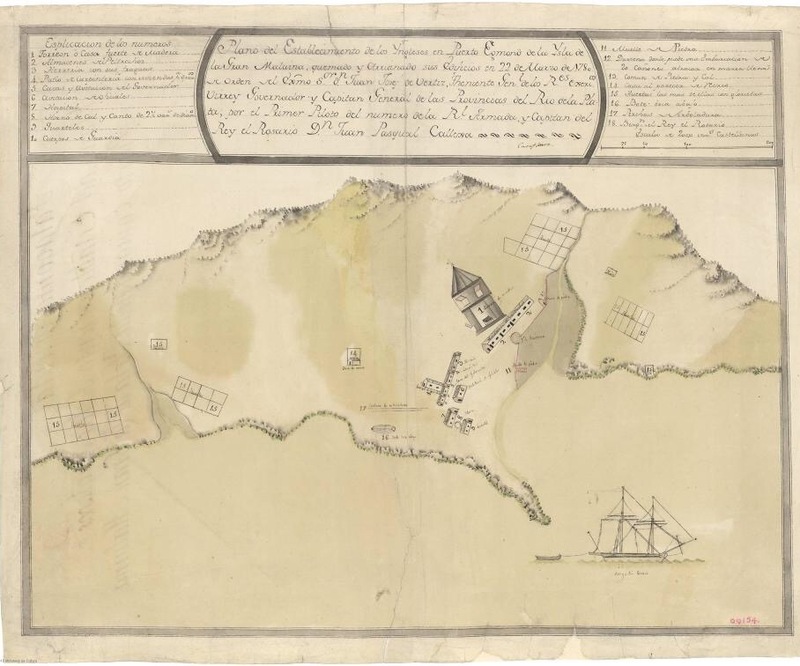 The instructions issued directly by the King of Spain to verify, once a year, that the English had not reestablished themselves at Port Egmont/de la Cruzada were crystal clear.69 This conclusion is supported by the fact that the decision to withdraw the settlement at Port Soledad in 1811 established that “annually a ship must be sent for reconnaissance, verifying the same also for other [settlements] in the Islands so that no other Power may establish itself or take possession of them.”70 The importance of this last assertion lies in its being the last decision to have been taken before Spain´s withdrawal. It is clear proof of Spain´s animus domini over the whole archipelago. Taking into account the territory´s insular nature, its geographical location and the absence of possession by any third State, there is no doubt that its continuous presence on Isla Soledad and its regular activities along the coasts and surrounding seas grant Spain sovereignty over the entirety of the archipelago. In fact, as seen above, archipelagos are geographical units par excellence. Once again, the fact that Spain considered itself sovereign over the whole archipelago, including Port Egmont, is well documented. This note is also useful to show the difference between the treatment of official British ships and private vessels, and how the latter could not be considered to be performing acts of public authority. The British pamphlet refers to the negotiations of the “Peace of Amiens” of 1801-1802 between France and its allies on the one hand and Great Britain on the other.75 It refers to a request to Napoleon made by Bougainville, the French representative at the Peace, to include a French claim over the Falklands/Malvinas in the negotiations. One British bloggers go even further, claiming that in Amiens, France had recognized purported British sovereignty over the Falkland/Malvinas Islands, by requesting British permission to establish a settlement, and that the refusal to accede to such a claim was an act of sovereignty by the British government. This is completely incorrect. The facts occurred as follows: Louis-Antoine de Bougainville never did get over the failure of his attempted expedition and the cession of his settlement to Spain, even though this had occurred in accordance with the law and ratified by his monarch. He complained about the Spanish having used the Falklands/Malvinas as a “prison” instead of following his plan of colonization. It clearly transpires from his memoirs that Bougainville considered the islands to belong to Spain and not to Great Britain. He obviously regretted the fact that at his time, the French monarch had recognised Spanish sovereignty over the islands due to their location within an area that was recognised as being Spanish – a fact which, according to him, was “imaginary”. This assertion contradicts his own conduct: Bougainville himself transferred his settlement in the Falklands/Malvinas to the Spanish authorities. The attitude he took in 1801 may be understood as a wish to re-colonise the islands. The French sailor did not consider the Falkland/Malvinas Islands to be British, which explains why he expressly distinguishes Canada and Newfoundland as British possessions. Likewise, his consideration that the Spanish settlement was located 500 miles away from the presence of any other European power clearly shows his awareness of the abandonment and destruction of Port Egmont and the inexistence of any British settlement on the islands. And finally, he is absolutely clear in indicating that Spain is the nation that has to give up its right, demonstrating his awareness that the Spanish Crown was the only power to exercise full sovereignty over the archipelago. He only considered that Britain should consent to the transfer of rights to France in the context of the peace agreement being discussed by European powers at the time, Great Britain being the maritime power par excellence, and in full knowledge of the fact that these were seas in which British (as well as American) fishermen hunted whales. However, on March 21st, 1801, a few days before Bougainville´s memorandum, Spain and France signed the Treaty of Aranjuez, by virtue of which the Spanish Crown, among other things, ceded Louisiana to the French Republic. Bougainville was too late with his request. From April that year, negotiations began between France and Great Britain over preliminary agreements in view of signing a treaty of peace in Amiens. The French Minister of Foreign Affairs, Charles Maurice de Talleyrand, saw the opportunity to put the issue of fishing on the table. He was not satisfied with how this activity was carried out in general, and particularly in Newfoundland, as a result of the 1783 Anglo-French treaty. He therefore ordered Louis Guillaume Otto, the French representative in London, to raise this issue during the negotiations. On September 7th, 1801, a conference took place between the parties, where the issue was discussed. The British minister, Lord Hawkesbury, stated that the discussion on such articles would take too much time and that he saw no problem in addressing these “merely commercial” issues in a separate future treaty.78 He certainly considered the treaty of 1783 sufficient to settle the fishing issue since no fisherman from either nation had brought any complaints. This answer did not suit the French representative, which was why the debate was put off until a later date. Realising this, Talleyrand sent a note to Otto whose content, he informed him, reflected the “the exact sentiments of the French Government.”79 The note made no reference to the issue of fishing, and less still to the Falkland/Malvinas Islands. The preliminary articles were signed in London, on October 1st, 1801, incorporating matters relating to fishing in Article XIII, maintaining the status quo ante bellum, that is, what had been agreed upon in the 1783 treaty, as suggested by the British representative in the negotiations. The question of sovereignty over the Falklands/Malvinas was completely external to the negotiation. British bloggers maintain that in these negotiations, the French government made its first request for the Falklands/Malvinas. This assertion is not consistent with official French documents,80 Napoleon Bonaparte´s correspondence,81 nor French parliamentary records,82 which make no reference to the Falkland/Malvinas Islands. Negotiations based on the preliminary agreement began in November 1801, aiming to reach a definitive treaty of peace among all the powers involved. The Spanish representatives arrived late, and the French decided not to wait to start negotiations with the British, including on subjects that directly affected Spanish interests. Taking into account Bougainville´s memorandum, Talleyrand decided to address the issue of fishing from another perspective. Knowing that a great number of English fishermen hunted whales in the South Seas, which were far more fruitful than the Northern Ocean, gave instructions to José Bonaparte, who was to be in charge of negotiating the definitive peace treaty, to modify Article 13 of the preliminary agreement, offering to relinquish Saint Pierre and Miquelon as well as France´s rights under by the Treaty of 1783, in exchange for sovereignty over the coast of Newfoundland and neighbouring islands. In the preliminary negotiations, the issue of sovereignty over the Falklands/Malvinas was never proposed and, therefore, never discussed. In the conference of January 19th, 1802, J. Bonaparte insisted once more upon the exchange of sovereignty over Saint Pierre and Miquelon for sovereignty over Newfoundland, a settlement for fishing purposes in the Falkland/Malvinas Islands (the only time the islands are mentioned in official French documentation) and the neutrality of fishing in wartime. Again, the question of sovereignty over the Falklands/Malvinas does not arise. Cornwallis´ reply was as Hawkesbury had ordered: the issues had already been discussed in the preliminary negotiations.85 That is to say, both of them considered these issues as a whole and having only one purpose: fishing. The above suggests that at no time did France consider Britain to be sovereign over the Falkland/Malvinas Islands. It was simply attempting to take advantage of a negotiation in which Spain had to participate in order to obtain a French settlement in the Falkland/Malvinas Islands for whale hunting and fishing purposes. At no time did Britain defend its alleged sovereignty over the Falkland/Malvinas Islands. If Great Britain did consider itself sovereign over the islands, the Peace of Amiens was a new opportunity to invoke its sovereignty (or at least, to use the argument in the negotiations to “trade” territory, in the same way it did with other areas of the globe.) As had happened a decade before during negotiations over the Treaty of San Lorenzo or Nootka Sound, Great Britain did absolutely nothing. For the rest, negotiations between France and Great Britain over fishing and whale hunting took place behind the back of the effective sovereign, Spain. The Spanish Crown did not sign the preliminary articles, and its representative, the Count of Azara, came to sign the definitive treaty one month after France´s last request, in February 1802. The negotiations were not published among official French documents, nor was the French parliament informed about them. Spain´s effective presence in the Falkland/Malvinas Islands, and its exercise of sovereignty in 1801-1802, show that the new interpretation made by the authors of the pamphlet and bloggers cannot be taken seriously. In short, until 1811 Spanish possession was effective, exclusive, continuous, peaceful, public and in good faith.86 These characteristics leave no doubt about the fact that at the moment of Argentine independence, Spain had sovereignty over the Falkland/Malvinas Islands and it was the Viceroyalty of the Rio de la Plata that administered them. Between 1774 and 1811, there is no trace of any act of the British state, nor any form of British claim of sovereignty over the Falklands/Malvinas – or even over Port Egmont. We may wonder why, if a British territory existed in the South Atlantic, the British naval station in South America established from 1808 was not situated there, but in a foreign territory (Rio de Janeiro) and was not even tasked with visiting the Falkland/Malvinas Islands regularly.87 The British naval station was well aware of the Spanish presence in the Falklands/Malvinas: the chief of the station sent a note on February 24th, 1809 in which he referred to an uprising in Buenos Aires and said that it had been controlled and “that the unruly leaders of the Cabildo were detained and put onboard a vessel for the Maloinas [sic], or Falkland islands”.88 The answer to these questions is simple: during the period in question, the Falkland/Malvinas Islands were not considered to be a British territory, whether by the Spanish, the British themselves, or any other power. Every British claim of sovereignty over the Trinidad/Saunders Island, over Gran Malvina/West Falkland or over the archipelago as a whole cannot compete with the continuous and unchallenged acts of public power carried out by Spain for four decades. The British pamphlet simply chose to ignore this essential part of history and legal analysis. 1 Pascoe, Graham and Pepper, Peter,op. cit., p. 6. 2 Universidad de Buenos Aires, Colección de documentos relativos a la historia de las Islas Malvinas, Buenos Aires, Facultad de Filosofía y Letras, Instituto de Historia, 1957, Vol. I, p. 351. 3 Conway to Lords of Admiralty, July 20 1765 (State Papers) in Goebel, Julius,op. cit., p. 231. 4 The pamphlet by the British “government” of the islands mentions that Byron disembarked on Gran Malvina (West Falkland), which is incorrect as Isla Saunders/Trinidad is a different island. 5 Pascoe, Graham and Pepper, Peter, op. cit., p. 7. 6 Lennox to Shelbourne, September 17, 1766 (RO State Papers, France, 271). 7 Universidad de Buenos Aires, op. cit., T. I, pp. 102-103. 8 Caillet-Bois, Ricardo, op. cit. p. 102. 9 Pascoe, Graham and Pepper, Peter, op. cit., p. 7. The pamphlet by the British “government” of the islands asserts that Spain “bought” the islands. 11 Bougainville, Louis-Antoine from, Voyage autour du monde , París, Presses Universitaires de Paris- Sorbonne, 2001, ch. III, p. 86. 12 Lennox to Shelbourne, September 17, 1766 (RO State Papers, France, 271). 13 AGN Sala X 8-10-3. 14 Bougainville, Louis-Antoine, op. cit. p. 61. 15 “[...] Just as a State which has occupied the coast or an important part of an island is deemed to have occupied the island as a whole, the occupation of the principal islands of an archipelago must also be deemed to include the occupation of islets and rocks in the same archipelago, which have not been actually occupied by another State”; individual opinion of Judge Levi Carneiro, Minquiers and Ecrehos case (France/United Kingdom), ICJ Reports 1953, p. 99. 16 Egmont to the Duke of Grafton, July 20th, 1765, Records of the Admiralty. State Papers, Foreign, Spain, Supplementary, Miscellaneous Papers, 1761-1770, in Ferrer Vieyra, Enrique, Segunda Cronología Legal Anotada sobre las Islas Malvinas (Falkland Islands), Córdoba, EGB, 1993, p. 364. 17 Zorraquín Becú, Ricardo, op. cit., 1975, p. 130. 18 Frances to Choiseul, December 22, 1770, AECP, Angleterre, v.494, f. 418 in Ferrer Vieyra, Segunda Cronología..., op. cit., p. 327. 19 Bougainville, Louis-Antoine de, op. cit., p. 92. 20 Royal Order of December 29th, 1766, in Zorraquín Becú, Ricardo, op. cit., p. 38. 21 Royal Order of February 25th, 1768 in id., p. 40. 22 Ruiz Puente to Hunt, November 30th, 1769 in Zorraquín Becú, Ricardo, op. cit., p. 41. 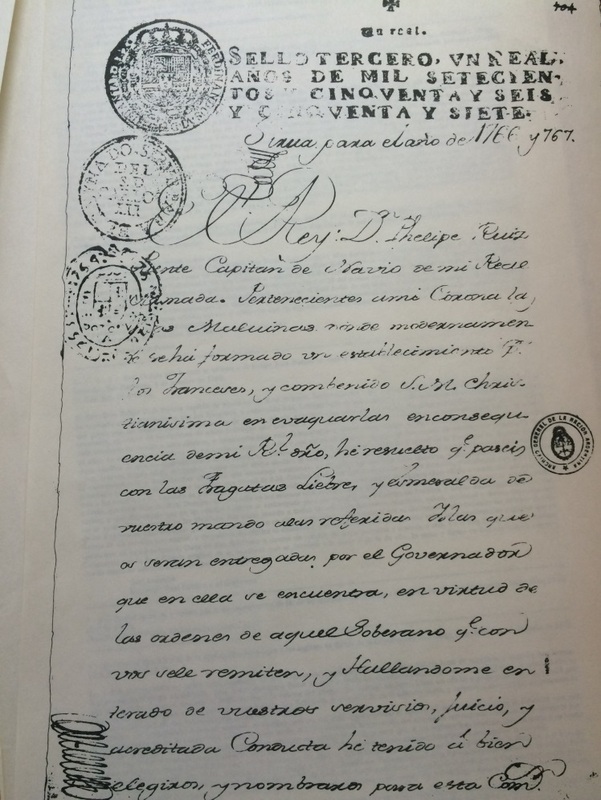 23 Note from Rubalcava to Hunt, February 20th, 1770 in Hidalgo Nieto, Manuel, La cuestión de las Malvinas, contribución al estudio de las relaciones hispano-inglesas en el siglo XVIII, Madrid, CSIC, 1947, pp. 645- 646. 24 Luis XV to Carlos III, December 20th, 1770, in AHN, Estado, leg. 2850. 25 Text reproduced in a number of works. See ie. Goebel, Julius, op. cit., p. 400, AGS, State, file 6980, annex to letter No2042; De Martens, Geo. Fred., Recueil de traites d’alliance, de paix, de trève, de neutralité, de commerce, de limites, d’échange etc.... des puissances et etats de l’Europe ...depuis 1761 jusqu’à présent, Tome 1 (1771-1779), Gotinguen, 2a ed., Librairie Dieterich, 1817, pp. 1-2; Parry, G., The Consolidated Treaty Series (1767-1772), Vol. 44, Nueva York, Oceana Publication Inc., 1969, pp. 425-426; Del Cantillo, Alejandro, Tratados, op. cit., pp. 519-520; Almon, J.,A Collection of All the Treaties of Peace, Alliance and Commerce, between Great-Britain and Other Powers: From the Revolution in 1688 to the Present Time, London, Vol. II, Opposite Burlington, 1772, pp. 328-330; British and Foreign State Papers 1833-1834, Vol. 22, London, 1847, pp. 1387-1388. 27 AGS, Estado, Legajo 6980, annex to letter No2042; in Zorraquín Becú, Ricardo, op. cit., pp. 199-200. 29 Frances to La Vrilliere, January 22nd, 1771, in AECP, Angleterre, vol. 495, fols. 79 a 81; cit. in Zorraquín Becú, Ricardo, op. cit., p. 86. 30 The Parliamentary History of England from the earliest period to the year 1803. Vol. XVI. A.D. 1765- 1771. London, Hansard, 1813, p. 1339. 31 Johnson, Samuel, Thoughts on the Late Transactions Respecting the Falkland’s Islands, 2nd ed., London, Cadell, 1771, p. 36. 34 Letter from Masseran to Grimaldi, November 28th, 1770 No2003, en AHN, Estado, leg. 4274 (1), p. 7. Letter from Masseran a Grimaldi, December 3rd, 1770, No2008, in AHN, Estado, leg. 6980..
35 Letter from Frances to Choiseul, November 29th, 1770, in AECP, Angleterre, vol. 494, fols. 259-263. 36 Letter from Masseran to Grimaldi, December 9th, 1770 in AGS, Estado, leg. 6980, letter No2011. 37 Letter from Masseran to Grimaldi, December 31st, 1770, AGS, Estado, leg. 6980, letter No2020. 38 Grimaldi to Masseran, January 2nd, 1771, in AHN, Estado, leg. 4261 (2). 39 Harris to Rochford, February 14th, 1771 (Record Office, State Papers, Spain, 186, No80). 40 Courtesy of the John Carter Brown Library, Brown University, Providence, U.S.A.
41 “Correspondence of William Pitt, Earl of Chatham”, Vol. IV, edited by William Stanhope Taylor, Esq, and Captain John Henry Pringle, London, A. Spottiswoode, 1840, p. 71. 43 “Correspondence of William Pitt, Earl of Chatham”, Vol. IV, op. cit., p. 87. 44“Anecdotes of the Right Honourable William Pitt, Earl of Chatham”, vol. III, ch. 39. 45 “Junius: including letters by the same writer under other signatures; to which are added his confidential correspondence with Mr. Wilkes, and his private letters to Mr. H.S. Woodfall; a new and enlarged edition...”, by John Wade, 2 vols., London, 1884. Letter XLII, II, 318-319. 47 AGS, Estado, leg. 6980. 48 Caillet-Bois, Ricardo, op. cit. p. 148. 49 Rochford to Grantham, March 6th, 1772, British and Foreign State Papers, vol. 22, p. 1393. 50 Francisco de Escarano to Grimaldi, Fabruary 11th, 1774, in Hidalgo Nieto, Manuel, op. cit., p. 261. 51 Rochford to Grantham, February 11th, 1774, in Goebel, Julius, op. cit., p. 456. 52 AGN Sala VII, Fondo Biblioteca Nacional, T.189. 53 Caillet-Bois, Ricardo, op. cit. p. 152. 55 On the requirement of both elements, objective (intention to act as a sovereign) and subjective (performance of acts of sovereignty), see Legal Status of Eastern Greenland, 1993, judgment, PCIJ, series A/B n° 53, pp. 45-46. 56 Notification issued by Ship Captain of the Royal Navy and Chief Commander of the Naval Base of Montevideo, José María Salazar of January 4th, 1811. Archivo General de Marina Don Álvaro de Bazán. In El Viso del Marqués (Ciudad Real) Expediciones de Indias Nr. 524. Pages 10, 11 and 12. 57 See, for example, the government agreement of April 18th, 1800 in Gómez Langenheim, A., op. cit., T. I, pp. 178-179. At the end of the period, the Commandant of the Falklands/Malvinas was also the commander of the main ship anchored at the islands. 58 AGN Sala IX 16-9-8. 59 AGN Sala IX 17-1-3. 61 AGN Sala X 2-3-15. 62 Question No 3, House of Commons, Foreign Affairs Committee, Session 1982-1983. Falkland Islands, Minutes of Evidence, Monday 17 January 1983. 63 Memorandum respecting the Falkland Islands. Confidential (9755), by De Bernhardt, Gaston. Printed for the use of the Foreign Office, January 1911, pp. 13-15 (FO 881/9755); Memorandum Respecting the Falkland Islands and Dependencies. Confidential (13336), by Field, John W., Foreign Office, February 29, 1928, pp. 7- 8, par. 51-57 (FO 371/12735). As is already known, what Spain claimed was sovereignty over the entirety of its colonial empire in America, in the context of the war of independence being fought in its ex-colonies. 64 Research Department, Foreign Office, Preliminary Memorandum on the Falkland Islands. Secret (17111), September 17th, 1946 (FO AS 5728/311/2), p. 6. 65 Pascoe, Graham and Pepper, Peter, op. cit., p. 7. 66 A.G.N. Sala IX 17-1-3. Letter from Bernardo Bonavía to Viceroy Sobremonte. Document N° 43. Document N° 44 contains Note N° 293, by which Navy Lieutenant Antonio Leal de Ibarra informs that he had handed over the station on March 21st. 67 Gómez Langenheim, A., op. cit., T. I, pp. 178-179. 68 See supra, fn 58. 69 See for example the Royal Order dated April 9th, 1774 issued by the governor of Buenos Aires, the note of the governor of the Malvinas Ramón de Carassa to Viceroy Cevallos dated June 18th, 1778 and the note written by the Governor of the Malvinas Salvador de Medina to Viceroy Vértiz dated March 4th, 1780. The first reads: “By the attached copy Your Majesty is informed of the same that the Governor of Malvinas has been warned of on this date, relating to the English having to abandon the settlement of Gran Maluina; of which I am notifying Your Excellency to verify that this request is complied with”. The second reads: “Sir. There not having come any Ship from the Province, at an appropriate time to conduct a patrol of Port Egmont as Your Majesty required every year...” Finally, the third affirms: “in the Notification dated October 22nd, Your Excellency requested me to destroy everything that exists at Port Egmont in carrying out reconnaissance of the territory...” (Gómez Langenheim, A.,op. cit., T. I, pp. 92, 98 and 100). 70 Archivo General de Marina Don Álvaro de Bazán. El Viso del Marqués (Ciudad Real). Expediciones de Indias No524. Pages 10, 11 and 12. 71 La Pradelle-Politis, Recueil des arbitrages internationaux, 2nd ed. París, ed. A. Pedone, 1957, Book II, pp. 414-415. See also the arbitral award Dubai/Sharjah, International Law Reports, 1993, Vol. 91, p. 606, and the following judgment of the International Court of Justice: Land, Island and Maritime Frontier Dispute (El Salvador/Honduras: Nicaragua intervening) C.I.J. Recueil 1992, p. 400, par. 66 et p. 419, par. 97. 72 AGN Sala IX 27-3-10. 73 AGN Sala IX 24-2-3. 74 AGN Sala IX 16-9-10. 75 Pascoe, Graham and Pepper, Peter, op. cit., p. 7. 76 Martin-Allanic, Jean-Etienne, Bougainville navigateur et les découvertes de son temps, París, PUF, 1964, T. II, p. 1543. 77 Mémoire du général Bougainville sur un projet d’établissement dans l’ile Malouine, in Martin-Allanic, op. cit., T. II, p. 1543. 80 Chez Garnery, Pièces officielles relatives aux préliminaires de Londres et au traité d’Amiens. Paris, Imprimerie de la Repúblique, 1803. 81 Imprimerie Imperiale, Correspondance de Napoléon Ier; publiée par ordre de l’Empereur Napoléon III, vol.7, Paris, Imprimerie Imperiale, 1861. 82 Centre National de la Recherche Scientifique, Archives parlementaires: de 1787 à 1860: Recueil complet des débats législatifs et politiques des Chambres Françaises, Vol. 5, Paris, Libr. P. Dupont, 1865. 83 Baron Du Casse, Albert Pierre Emmanuel, Histoire des négociations diplomatiques relatives aux traités de Mortfontaine, de Lunéville et d’Amiens, précédée de la correspondance inédite de l’empereur Napoléon 1er avec le cardinal Fesch, París, Palais Royal - Galerie d´Orleans, 1855, Vol. 3, pp. 11-12. 84 Murray, John, Correspondence of Charles, First Marquis of Cornwallis, London, William Clowes and Sons, 1859, Vol. 3, pp. 426-427. 85 Chez Garnery, op. cit., p. 193. 86 See for example the arbitral awards in the Island of Palmas case (“continuous and peaceful display of territorial sovereignty”, United Nations RIAA vol. II p.839) and Dubai/Sharjah (“International law also requires demonstrations of sovereignty to be both peaceful and public [and] the exercise of authority by the State claiming the territory to be continuous and of a certain duration”, International Law Reports, 1993, vol. 91, p. 624). 87 The limits of the South American naval Station were the coasts and waters of South America to the south of the Equator and to the west of the meridian of 30o west, as well as the eastern coasts of the Pacific Ocean. . GOUGH, Barry M., "Sea Power and South America: The 'Brazils' or South American Station of the Royal Navy 1808-1837". Salem, The American Neptune, 1990, vol. 50, No1, p. 29, cites as a source: Admiralty Minute, 18 December 1816, Adm. 3/88, Public Record Office, Kew. 88 Smith a Pole, February 24th, 1809, Graham, Gerald & Humphreys, R.A. (eds. ), The Navy and South America 1807-1823. Correspondence of the Commanders-in-Chief on the South American Station, London, Navy Records Society, 1962, p. 24. 89 ICJ Reports 1962, p. 23.